For those who live in the western half of the United States, water has always been seen as a precious resource – especially during recent years as long-term drought has made its impact felt with dwindling water supplies. As a result, many of us find ourselves looking for ways to save water and as the largest user of residential water – the landscape is the first place to make significant changes. Let’s look at three different low water landscape options and how they can help you save water. Option #1: Drought Tolerant – This landscape is characterized by lush green, flowering plants such as bougainvillea, lantana, oleanders and yellow bells – all of which do well in hot, arid climates in zones 9 and above. 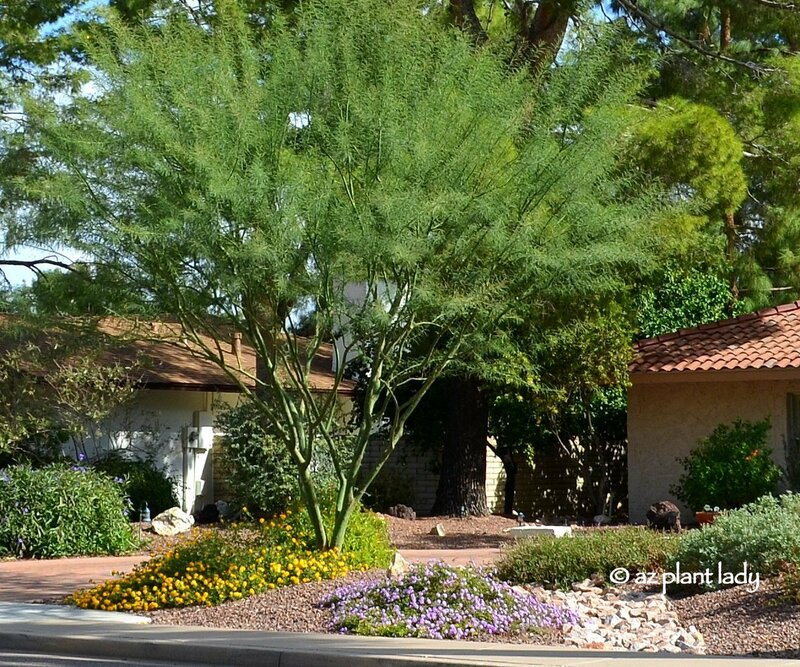 While most of these plants aren’t native to the Southwest, they are considered moderately drought tolerant and are suitable for those who want more a lush-appearing desert garden. For best results, deep water once a week in summer and every 2 weeks in winter. Option #2: Moderately Drought Tolerant – Native, flowering plants make up this type of landscape and include plants like chuparosa, damianita, penstemon, Texas sage and turpentine bush. Because these plants are native to the Southwestern region, they need infrequent watering to look their best – a good guideline is to water deeply twice a month in summer and monthly in winter. Option #3: Extremely Drought Tolerant – For a landscape that can exist on very little water, a collection of cacti and succulents are the way to go. Columnar cacti such as Mexican fence post, organ pipe, saguaro and totem pole add height to the garden alongside lower growing succulents like agave, candelilla and desert milkweed, which can be used to create a landscape filled with texture and contrasts. Golden barrel, hedgehog cacti and mammillaria fill in smaller spaces and look great next to boulders. Once established, they can survive on natural rainfall, but will look best with deep monthly watering in summer when possible. It’s important to note that plants should be watered deeply to a depth of 2 ft., which promotes deep root growth and the soil stays moister longer. Whichever option you select, creating an attractive water saving landscape is within your reach that will thrive in our drought-stricken region. These landscapes are so foreign to me, but I never tire of seeing them on your blog. Any one of those choices are gorgeous! I enjoy both 1 and 2. My eyes need the green and flowers still, because of living all of my life in Southern California. Beautifully written AZPlantlady-lovely images of inspiring options for folk living in dryer climates! Purple Blooms for the Fall Garden Lilies in the Fall Garden?